Having the best walking shoes for men is necessary for regular exercise and walking. Walking and jogging on a daily basis is one of the best habits people can acquire for better health. Many people love to jog for miles, and they enjoy boosting their stamina through regular walking. But a regular walk can only bring comfort and provide you the maximum health benefits when you are walking with ease and with all your joints supported in a comfortable manner. Having correct posture during the walk is essential, and it solely depends on the posture and positioning of your feet. If your feet are kept comfortable, you can surely have a brisk and easy walk without having any pain or fatigue after covering a few yards. So, it is quite clear that keeping your feet in a comfortable posture is crucial to have a nice, easy, and long walk. This is only possible when you have a perfect pair of walking shoes to wear. So, why not consider finding some of the best walking shoes you may need to walk comfortably and enjoy your health? What to Look For in the Best Walking Shoes for Men? The first thing to look for is a little but supportive heel shoe that bevels in. A heel that flairs out or a thick one leads to the slapping down of your feet rather than the rolling that is needed. Such will slow down your forward momentum as it increases sore shins occurrence. The feet of a walker will hit the heel first before gradually rolling from the heel to the toe. This means that someone looking for a walking shoe for men will need a sole that’s flexible and more bent on the toe region than that of a runner. The toe area should be able to be twisted and bent easily. The feet of a walker will hit the heel first before gradually rolling from the heel to the toe. This means that someone looking for a walking shoe for men will need a sole that’s flexible and more bent on the toe region than that of a runner. The toe area should be able to be twisted and be​​nt easily. A shoe that fits you properly is among the most important things of all the factors that walking men need to consider. With enough room to the toe box, your shoe will be the best for walking. About half an inch or rather a thumbnail width should be left between the end of a walking man’s shoe and his nails. Your toes need to freely move around the toe box area ​​hence the need for a wide shoe. The shoe needs not to pinch you or bind more specifically across the ball or arch of a walking man’s foot. When going shopping for w﻿﻿﻿﻿﻿alking shoe, you should try fitting it while putting on the socks that you will be using the shoe with. You should also go at the end of the day and after a walk when your feet are slightly swollen. It is possible that your feet may be of different sizes and that’s why you need to try both shoes and not just one. These may make a gr​​eat difference indeed. 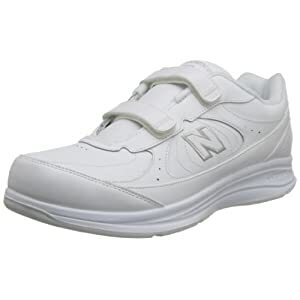 When there is a need of a comfortable and sturdy, snug fit pair of shoes which can be considered as the best walking shoes for men, New Balance Men’s Walking Shoes are the ones that can serve at best. These shoes have got a soft synthetic outer sole that is made to provide excellent support and comfort to the feet. Due to its high level of comfort features, the shoes can give you an easy walk with no pain or fatigue issues. The whole structure of the shoes is made in a way that provides a snug fit to the feet and has specialized ABZROB system to keep the heels safe from extra pressures. Such features make sure the feet will be kept in its best posture and would cause any slip or turning. The sole is not removable and fixed. The shoes are made with the leather material having two hook and loop strapping locks and a well adjusted upper side to give it an athletic shape and are best for walking purposes. The shoes are assembled in the USA with the help of highly skilled workers who are always providing the best of their skills. Some shoes are made for average comfort and some outclass all of their competing items. This one is above and beyond of its high quality competing brands. 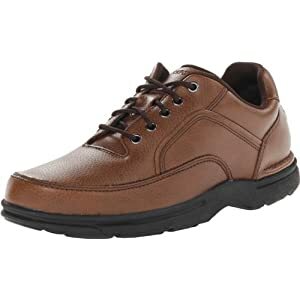 This Rockport Men’s walking s​​hoes provide a fusion structure with all the comfort features and a classy casual look from outside. The vamp is made to accommodate the lace-up area and is padded with a soft and well-cushioned tongue to keep the foot comfortable and well fitted like a hand in a glove. The collar of the shoes also compliments the language by providing extra cushioning and soft wedge keeping the ankle area smooth and well supported. The collar of the shoes also compliments the tongue by providing extra cushioning and soft wedge keeping the ankle area easy and well supported. The sole is removable. The shoe bed is made of Latex foam which is an excellent feature making the shoes even more supportive and comfortable while walking on an uneven surface. It keeps the feet in place, in a comfortable and safe manner. For a complete metatarsal support and stable heel accommodation, the shoes come with San Crispino structure with a strobe in the front to make sure the shoe provides a well balanced inner surface for a comfortable walk. The mesh lining gives an extra fresh feel by absorbing moisture and keeps the inner side breathable and sweat free. Another lace up men’s ﻿walking shoe having a casual look and a well designed inner sole and overall structure. This pair of shoes is a perfect fit for the people who need an extra support and comfort while they are walking for miles. The shoes have a rubber made outer sole having a superb grip design, enabling the user to walk on any surface without slipping issues. The shoes have a rubber made outer sole having a superb grip design, enabling the user to walk on any surface without slipping issues. The overall inner surface is soft and features the functional EVA footbed design by the Rockport making the s​​hoes a perfect accessory for daily use. Like many other lace-up shoes, this sports style round toe ​best-walking shoes for men​​​ has a superior feel of comfort to give the user best style and a perfectly snug fit with the help of lace up closure. The tongue and the collar have sufficient cushioning to give a soft yet sturdy support while keeping the foot in its correct position. The outer sole is made of synthetic material having an excellent grip on a wide range of surface. The inner sole is removable and has the Strobel construction for a better toe support. The overall inner sole has EVA sole design giving the foot the best level of comfort and support.. 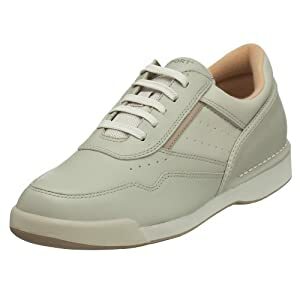 This imported shoe provides perfect support for those who need a soft walk to help avoid fatigue and discomfort caused by shoes having hard or non-adjustable soles. Another feature that makes the shoe a little different from average shoes is its outer textured leather that gives it a fabulous modern look as a casual walking shoe. The outer sole is made of synthetic material having an excellent grip on a wide range of surface. The inner sole is removable and has the Strobel construction for a better toe support. The overall inner sole has EVA sole design giving the foot the best level of comfort and support. 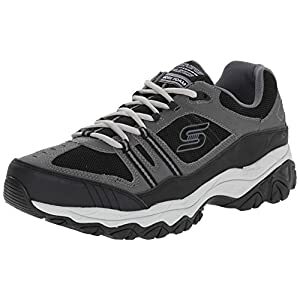 Skechers have always been a pioneering manufacturer of comfortable and well-designed sneakers and shoes. 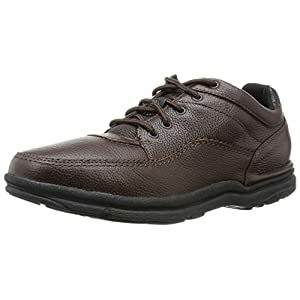 This one is another great example of lace-up walking shoe for men. The upper side is a fusion style mixture of mesh fabric, leather material, metal components, laces and a slight rise in the heel area. The collar and the tongue are stuffed with soft cushioning to give you a breeze like a walk whenever you need. The most prominent features of these sport shoes is its Article-elite structure, providing the inner sole maximum shock absorption and support and also the inner memory foam sole help cradling the feet in its natural posture so that the joints will not be strained at any cost. There are a lot of things that have to be considered as important when you need to decide on the best pair of walking shoes for men. It is important because you may find numerous brands and items offering more or less the same kind of features and quality level that others also promise to provide. In such cases, the buyer may feel a bit overwhelmed because of numerous same-level choices, and this may lead to getting the wrong item and leaving the better options unchecked. The first thing that you should be looking at is the kind of equipment being used. Mostly, the materials can be grained leather, leather, synthetic materials, and rubber. You may choose what you think is the best one for you. But never go for a cheap material that can easily tear off. Check for the various types. Some shoes are sporty style, some have a casual shoe design, some of the shoes come in a sneaker-like design, while others seem a bit formal. You may also have to decide on the closure type, either a lace-up shoe or hook and loop with straps design. If you have got bulky feet, hook and loop would be the best ones, but if you need well fitted and snug shoes for thin feet, you may go for lace-up shoes. The outer sole is mostly made of rubber or a synthetic material. The only difference is the shape and structure, and also the height is given to the sole. You can find plain-soled shoes as well as heightened shoes with a bit bulkier sole. Weight is important. You should always go for a medium- to lightweight shoe if you need it for walking purposes. Fit and comfort are important. Look for a sufficiently padded shoe with padded tongue and collar and also the ones having Strobel first support and a shock proof heel support. You can find various kinds of inner sole options. Some shoes have removable inner soles while others are fixed in place. You may also have latex or memory foam inner soles for better cradling of the feet and keeping the feet in the best posture. You can go for a removable sole, or memory foam/latex sole if you have issues like joint pain, arthritis issues, etc., as this will help in reducing the pain and fatigue. Make sure the shoes are long lasting and won’t face any wear and tear issues after using them for only a few weeks. Design and looks are important if you are style conscious. You may select any color or texture that you like. Read a lot of online reviews for the best walking shoes, these this will give you a better idea whether the shoes are worthy enough to be used as your walking shoes. You can compare the price to see whether there is any difference or not. But in most of the cases, the more comfort you need, the more you will have to pay. But walking shoes are mostly available at a reasonable cost without compromising the quality and level of support. 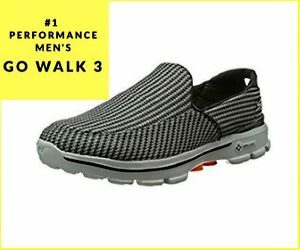 Concluding our discussion about the best walking shoes for men, we can say that the main concern while selecting these shoes has to be the comfort, the level of support, and how well you can walk while wearing those shoes. Style, price, and extra features are secondary but still, play a major role in determining the worth of any shoes that you are going to buy.It is very common for people to ask for the recommendation of the best shoes they can put on for a specific task such as walking, running among others. Someone who is not experienced in the subjects of shoes will want to recommend a given type of shoe to you just because it worked well with them.This is not the right criterion for choosing the best walking shoes because we have different types and patterns of feet. Wait, and the patterns may almost be similar, but the walking styles are completely different from each other. Although there are some slight differences between the shoes that go well with one man from the other, there are some general basics that can guide anyone looking for walking shoes for men. Pronators need to look for a walking shoe that has a motion control device located in the midsole. They also need to go for a board lasted and straight shoe that has a provision of ​support for the foot inside ​thereby preventing the over usage of the foot inside edge. They also need a reinforced heel counter to enhance control together with stability. The inward roll can further be prevented by the use of sturdy uppers together with stability straps. Avoid shoes that have too much padding since these do exaggerate pronation. Supinators need a shoe that has an outer sole, midsole & insole being designed for absorbing extra shock together with having greater stability. Due to the more rigid feet that supinators have, slip lasted and curved shoes are probably the best for them. When a supinator is looking to buy a walking shoe for men, he should buy shoes that have r​​einforced material around their ankle region. The shoes should also have firm heel counters to maximize the support is given to the heel and the ankle. Support will further be boosted by the extra cushioning below the foot’s ball. So many brands do sell walking shoes for men outside there. Some of them have quality products while yet others have products that have got compromised quality. The brands below are among the top brands, and you are sure of getting long lasting walking shoes for men that ​​will serve you with comfort and good support. The list is however not limited to just the brands below. They include; Rockport, Gear, Oasis, Brooks, Saucony, Mizuno, Adidas, Pearl Izumi, Nike, Merrell, New Balance. Achilles Notch: This is designed to reduce stress on the vital Achilles tendon. Ankle Collar: This ensures that the ankle is properly fit by cushioning it. Upper: Used for holding the shoe on the feet of the wearer. It’s normally made of synthetic material, mesh or leather. The mesh upper is the best for walking shoes since they offer better ventilation in addition to their light weight. Insole: This is used for cushioning and supporting the wearer’s foot together with the arch. Removable insoles should be preferred especially by those who sweat heavily. This makes laundering and drying to be easy. Midsole: This is a provision of cushioning, comfort together with shock absorption. Outsole: For making contact with the ground. Threads and Grooves are good for helping in the maintenance of traction. Toe Box: For the provision of toe space thus helping in the prevention of calluses. Gel Pad: Used for cushioning and impact reduction when the walking man’s fee strikes the ground. Roll bar: Used for stabilization of the feet when it tends to roll inward during the time when it strikes the ground. Consideration of the feet’s shape plays an important role here. It is obvious that feet do come in different shapes and sizes. To keep painful problem away, you need to consider these two factors before you buy a walking shoe. The key factor is that your ​​shoe needs to conform to the feet’s shape and not the vice versa. Let the shoes neither be too neither narrow nor too wide for both will lead to calluses and painful; blisters. Foot disorders can also be aggravated by a toe box which isn’t high enough to give e​​nough room for the toes. Such disorders include hammertoes bunions and others. The intricate muscle, bones, tendons and ligament alignment in one’s feet forms the lengthwise or longitudinal arches and side-to-side metatarsals. While one walks, these springy but flexible arches will help in the even distribution of your body weight across the feet. The arches, therefore, play a very important role on how one adapts to the various walking surfaces. You, therefore, need to choose a walking shoe which will accommodate the type of your arch. Your feet will fall in either of the arch categories below. Neutral-Arched Feet. Your feet are neither overly flat nor are overly arched. Shoes were having firm midsoles and straight to semi-curved lasts together with a moderate stability of the rear foot. Low-Arched or Flat Feet. Muscle stress together with joint problems can be caused by flat feet or low arches. Walking shoes that have a straight last together with motion control would be the best for those having flat feet. High-Arched Feet. High arches at times contribute to excessive muscle and joint strain since the feet may not be a well absorbing shock. This is especially the case when you are performing a lot of jumping and impact activities. Due to this lack of natural shock absorbers, look for a shoe that has got sufficient cushioning. Curved lasts may help in some situations. Orthotics comes from the science and design of orthoses. Orthoses are defined as a device applied externally for modification of the structural and functional features of the skeletal and neuromuscular system. Orthoses are custom foot supporters. Their design enables them to more efficiently fit your feet than the over the counter arch supports. They are also good for balancing the biochemical inequities of one’s feet and legs. To prevent Plantar Fasciitis (heel and arch pain), together with the lower leg tendonitis and knee pain like “runner’s knee,” iliotibial band syndrome and chondromalacia patellae, you should buy orthoses for your walking shoes rather than the common arch supports. Never go shopping for a walking man’s shoe while in a hurry. Try walking to the shoe store on that hard surface for some time before landing on a given pair of shoe. If the stores you are in​​ do object to this practice, just move on and find another store. It is more worth it to go to the next shop than to end up buying something that will bring you discomfort. Try your new shoes out by wearing them in the house for some few days. Never venture outdoors unless you are pretty sure that the shoes will work out. There is nothing as uncomfortable as walking in shoes that do not fit you well. It is better for you to travel in uncomfortable shoes because anyway, you can remove them for some moments while in that cabin. That’s virtually impossible with walking shoes. Spending some extra dollars on a pair of walking shoes for men is worth it. There is no need of buying shoes that will be uncomfortable for you. Secondly, in many cases, expensive shoes do last longer than the cheap once. You will keep on buying these cheap ones, and in the long run, the total expense becomes more than if you would have bought an expensive pair of shoes. Buying two or three pairs of walking shoes will also enable you to be rotating the shoes. This will make the ones you have to last longer than they would have lasted. Calf Stretch: With a single foot in front, dip into a lunge slowly so that the calf muscles can be stretched. Do this with alternate legs so as to stretch the calves of the two feet. Back Thigh Stretch: While in a laying position, raise a leg and then hook your fingers just behind the knee around this leg. Pull either leg towards you so as to stretch the legs around the back of your thighs. You can alternate this with a standing position. Front Thigh Stretch: Bend your leg from a standing position and grab your toe tip from behind. Pull your leg gently closer to stretching the muscles of the thighs from in front. Outer Thigh Stretch: Lay down, cross one leg’s ankle over the other’s top thigh. Slowly use the ankle to pull the other leg and carefully bringing it across your body. Walking has always been highly recommended for its health benefits. Not only it strengthens muscles and bones and keeps you fit, but it also prevents heart disease, cancer or diabetes. For achieving the best walking experience, the right walking shoes for men are the fundamental element. Choosing the right walking shoes can provide stability, comfort which can affect the proper posture of the spine and absence of fatigue. To achieve that, the most important features of the best walking shoes are the type of arch, the level of foot pronation, the number of use and the perfect fit. With such great information in mind, you are set and ready to go shopping for the ﻿﻿﻿best walking shoes for men. Shoes that will support you cushion your feet; give comfort and above all, shoes that are long lasting.